The assignments go from the end of the 9 weeks to the begin. ​Learning Target: I can describe the states of matter. Warm up: Complete the vocabulary matching fold able, and glue it into your interactive notebook. 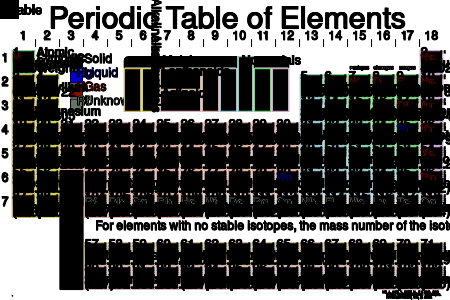 Warm up: What does the periodic table tell us about atom's of elements? Complete the element activity from yesterday. Use the materials that I give you to construct a model of an atom. Warm up: Complete the vocab activity and glue it into your interactive notebooks. ​Learning Target: I can compare elements and atoms. I can also describe compound, mixture, crystals and molecules. See the flex book on the smart board for the interactive part of the lesson. Ticket out questions see page 95 of Flex book. Warm up: What is the periodic table? Learning Target: I can explain how the periodic table of elements can be used to explain the properties of atoms of elements. 1. How is the periodic table arranged? 2. What does the atomic number tell us about an atom of an element? 3. What does the atomic mass tell us about an atom of an element? Lets practice- using the worksheet that I give you show me what you have learned? Introduce adopt an element project. This project will be due Friday, Oct 2. Warm up: I told you that the periodic table is like a grocery list if you wanted to make the world, what did I mean? Learning Target: I can explain how to use the periodic table to make models of atoms of elements. Vocabulary activity-match the vocabulary words with there definition. Ticket out: Draw and label an atom of the element oxygen. Essential Question : What is an atom? Learning Target: I can compare atomic number to atomic mass. Why does Matter, Matter handout and worksheet. Test is tomorrow on Properties of Matter. Goal for test and what are you going to do? Learning Target: I will define what an atom is. Warm up: List five examples of physical properties and two examples of chemical properties. Learning Target: I can distinguish between physical and chemical properties. Review and go over power points that we started last week. Learning Target: I can describe density. Warm up: What is density, and how do you determine it? Learning Target: I can describe volume. Ticket out: What is volume? How do you find volume of both regularly shaped and irregularly shaped object? Learning Target:I can describe solubility. Complete Matter Quiz you may use your notes and interactive notebook. Warm up: First Core you need to complete the Study Jam test we started yesterday. Third Core you need to complete the virtual lab that we started yesterday. Warm up: Compare physical properties of matter to chemical properties of matter. You can use a graphic organizer to do this. Warm up: List the steps of the scientific method, and explain three of the steps. Learning Target: I can explain why it is important to follow direction, to listen, and to know my role in the science lab. Leader: This student is in charge of organizing the final product of the project, be it a paper, a presentation, etc. That doesn't mean technical details, but of making sure that the project meets the standards set out by the instructor (often as a rubric), plus any extras stipulated by the group. These standards generally include punctuality and completeness. Reporter: This person would be responsible for the technical details of the final product and would be ready to summarize the group's progress and findings to the instructor and to other groups. Ticket out: In your interactive notebook write a brief summary explaining what you have learned today. Tell me three things that you did correctly, two things you can do better next time, and one way I can help you. Warm up: Why is it important to complete all of your assignments in class and do your best? Learning Target: I can identify the steps of the scientific method. Go over study guide, play kahoot. Essential Question:Why is the scientific method essential in life?